I head to the kitchen for some cereal to hold me over. Pomegranate Blueberry Crisp from Trader Joe’s. It is delicious, but a little too sweet for me in the mornings. I also usually whip up a smoothie to drink mid-morning at work, when I knew I will be hungry again. 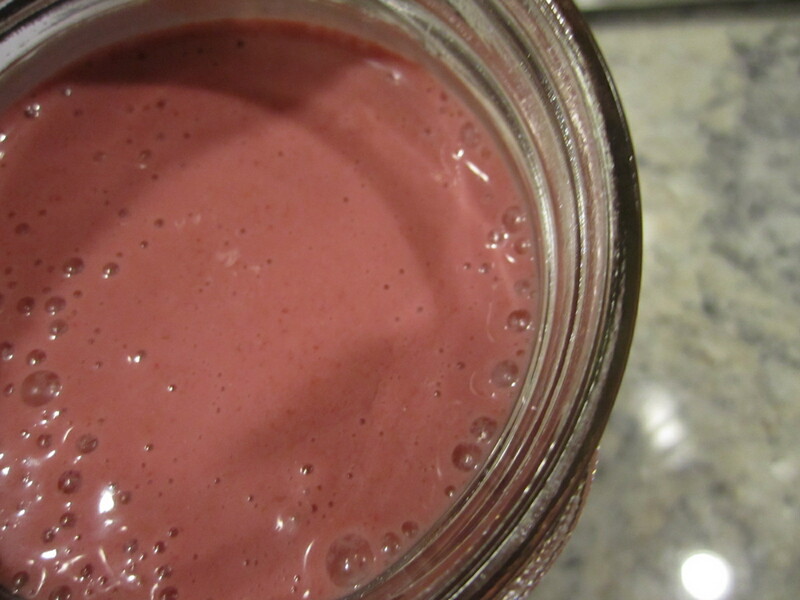 I love smoothies as a morning snack! They are filling and refreshing. For lunch today, I made an old favorite, which was pieced together after scouring through our empty cabinets and fridge for lunch. 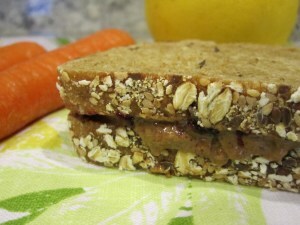 Almond Butter, Banana and Jelly Sandwich on Millet Bread. 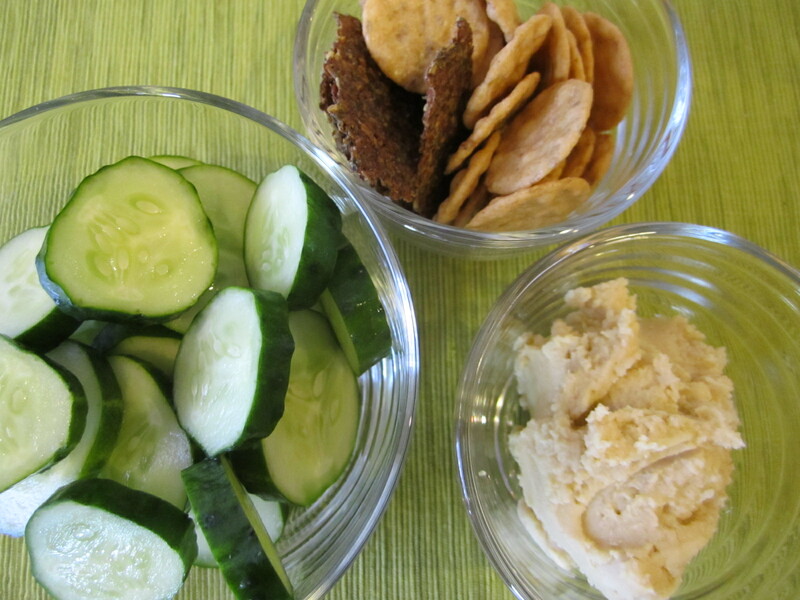 I seem to get hungrier for snacks than I did before and I think it is because my meals have been smaller. I don’t have as much room for food in my stomach anymore (!! 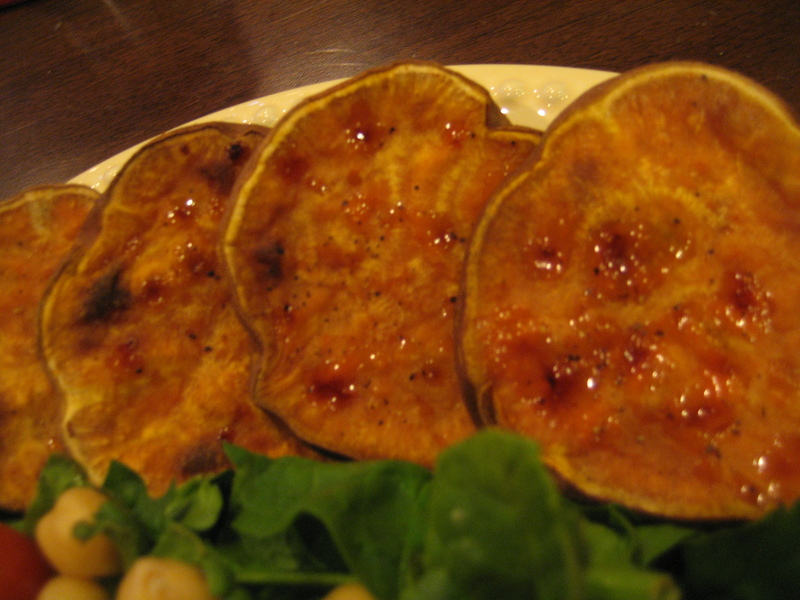 ), so smaller meals and snacks sit much better with me. And, for dinner, I stopped at Panera Bread on my way to our Newborn Essentials class! 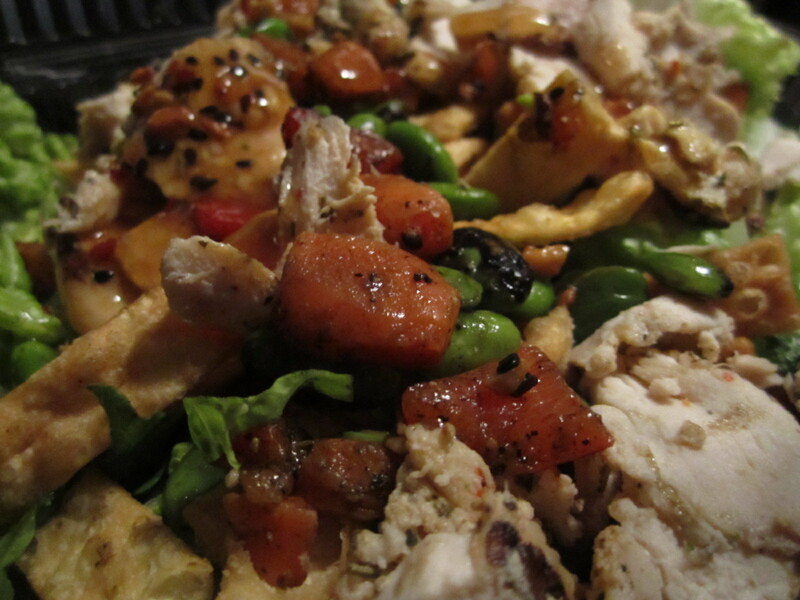 Thai Chicken Salad, which was packed with romaine lettuce, chicken, peppers, carrots, edamame, wonton crisps and a light thai dressing. 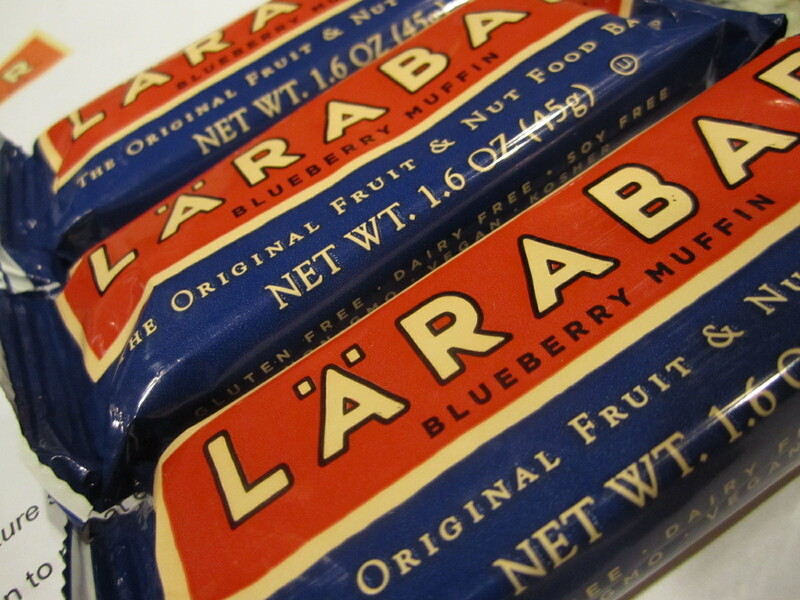 And, during class I snacked on a Blueberry Muffin Larabar, which is a new flavor that was sent to me from Larabar as a sample. This flavor is delicious! It smells just like fresh baked muffins and tastes just as good. 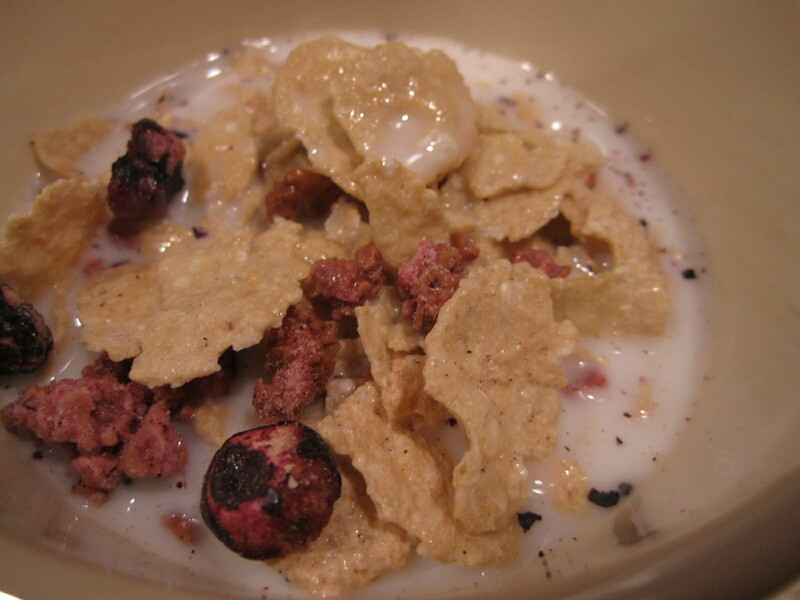 After my 30 minute powerwalk yesterday morning, I was craving cold cereal with milk. I made up a bowl with 3 different types of cereal and 1% milk. It was a good mix of cold and crunchy. 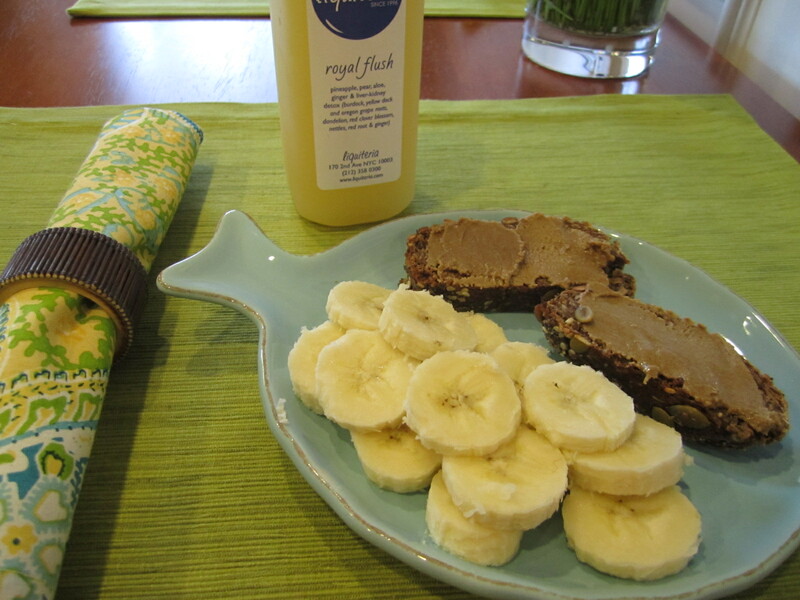 Topped with a super ripe banana for potassium. It was a crazy day at work, so all of a sudden it was 2 o’clock and I was more than ready for lunch! Good thing I packed a salad from home. 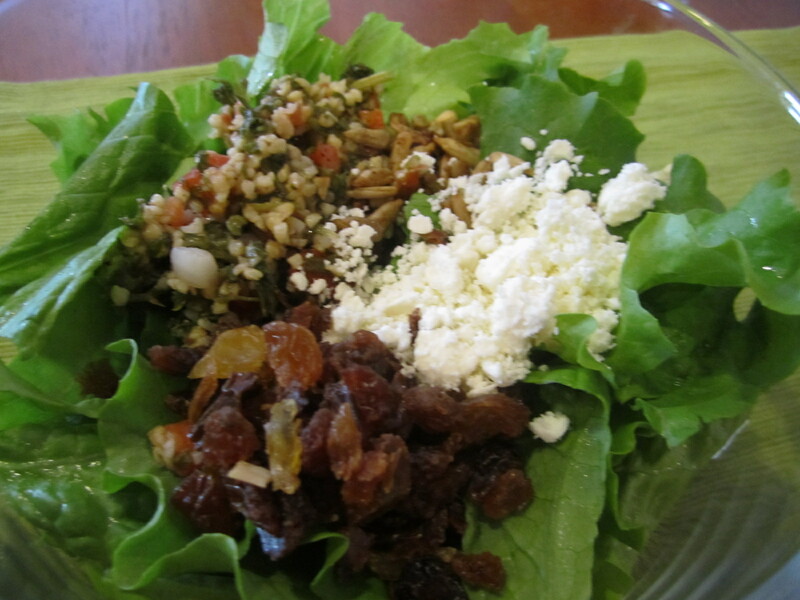 CSA lettuce topped with tabouli, chopped raisins, sunflower seeds and feta cheese. 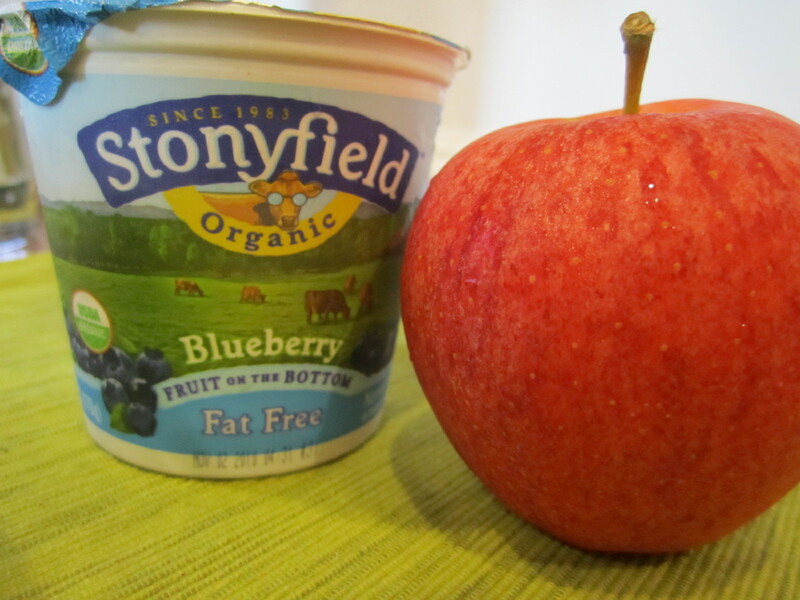 With a yogurt and apple on the side. 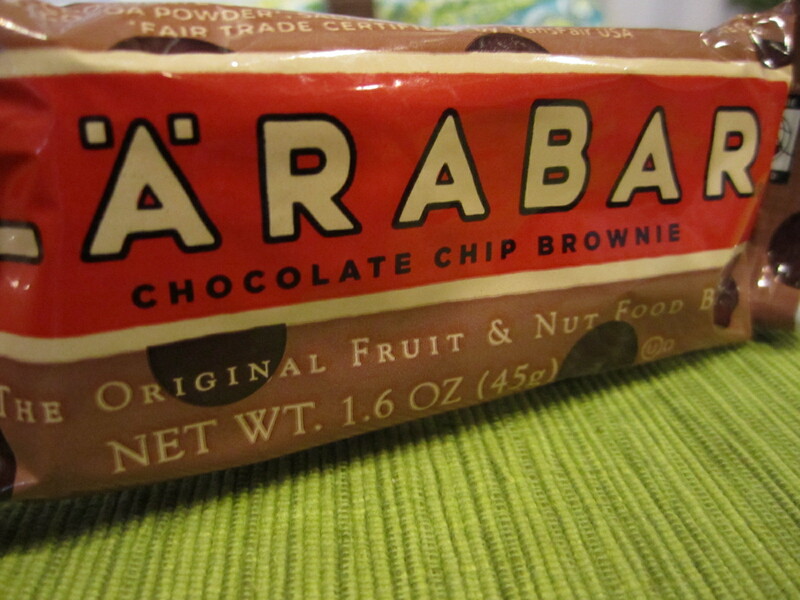 After a mid-afternoon snack of a Brownie Larabar, I was ready for our pizza party! 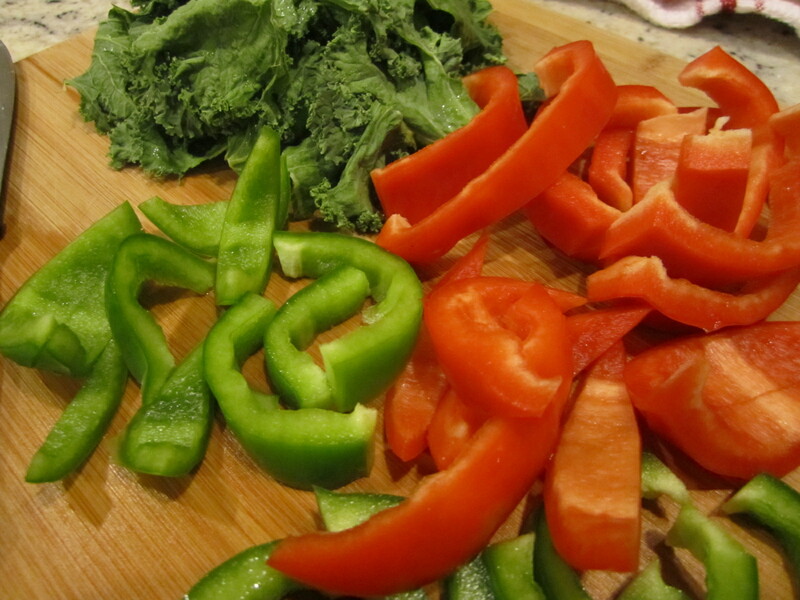 I chopped up some peppers, kale and chicken sausage for toppings. Cooked before makingthe pizza. 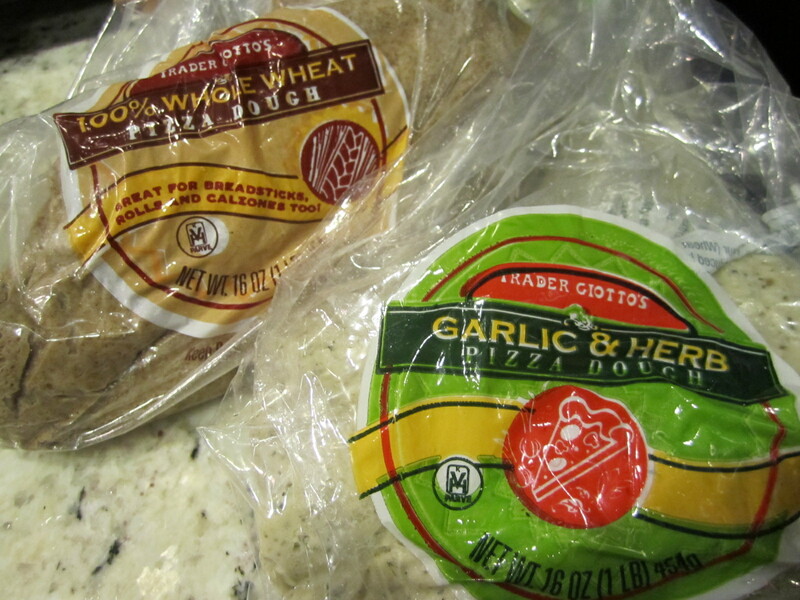 Whole wheat and my favorite garlic and herb dough! 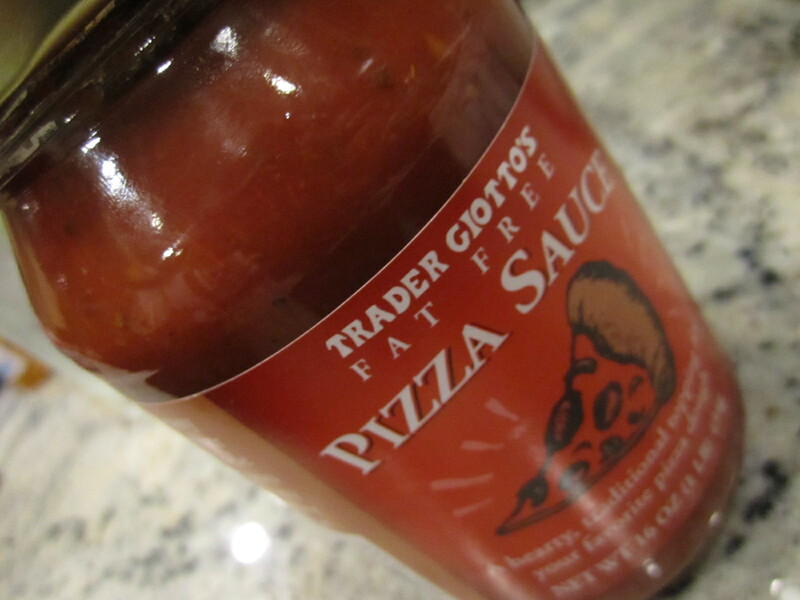 Their dough and sauce are made with simple ingredients! 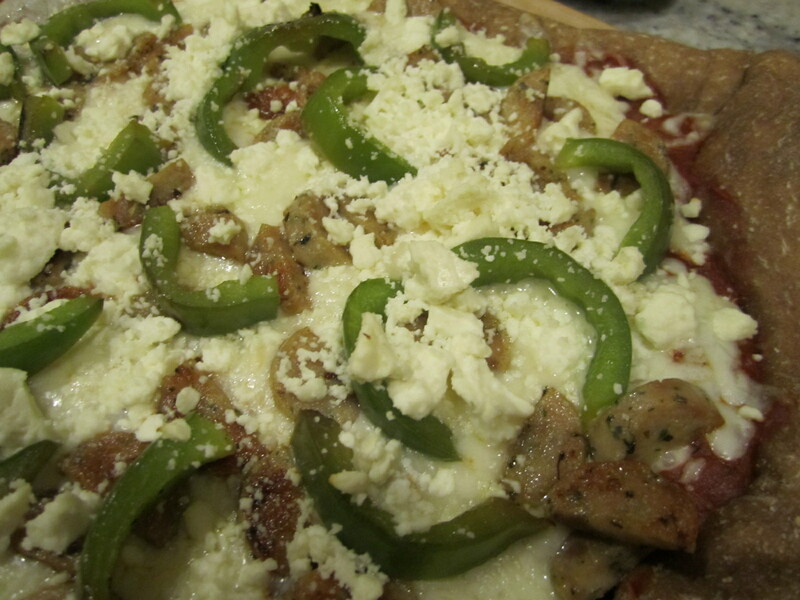 Pizza #1 – Whole Wheat dough with mozzarella cheese, chicken sausage, green pepper and feta cheese. 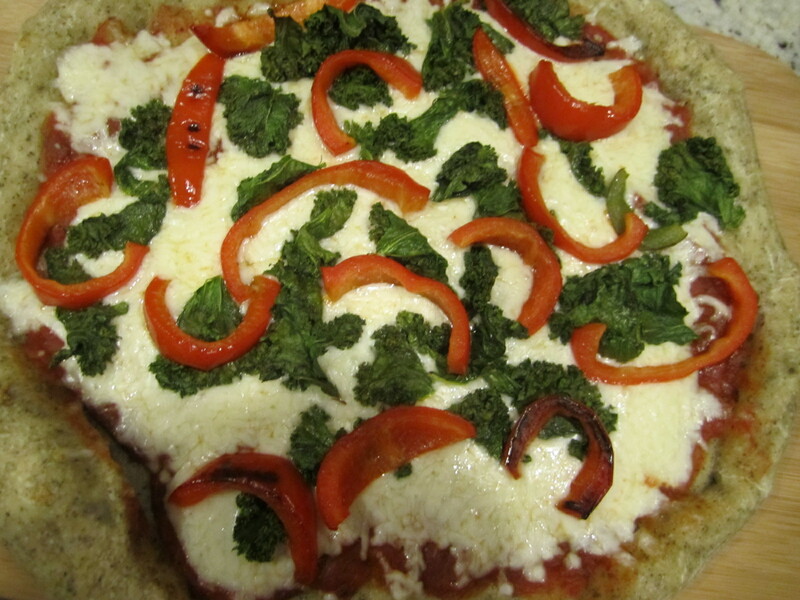 We cook our pizza on a preheated (in a 400* oven) pizza stone, which works great! I pre-bake the dough for about 5 minutes, add the toppings, then cook for an additional 7-10 minutes. They come out great everytime! 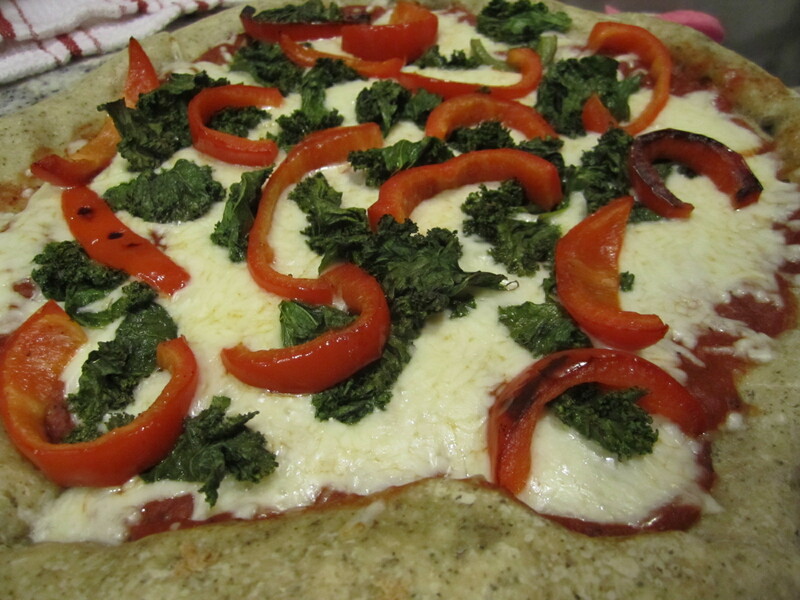 Pizza #2 – Garlic & Herb dough with mozzarella cheese, red pepper and sauteed kale. I enjoyed a slice of each (minus the chicken sausage, which I removed) and they were both delicious! 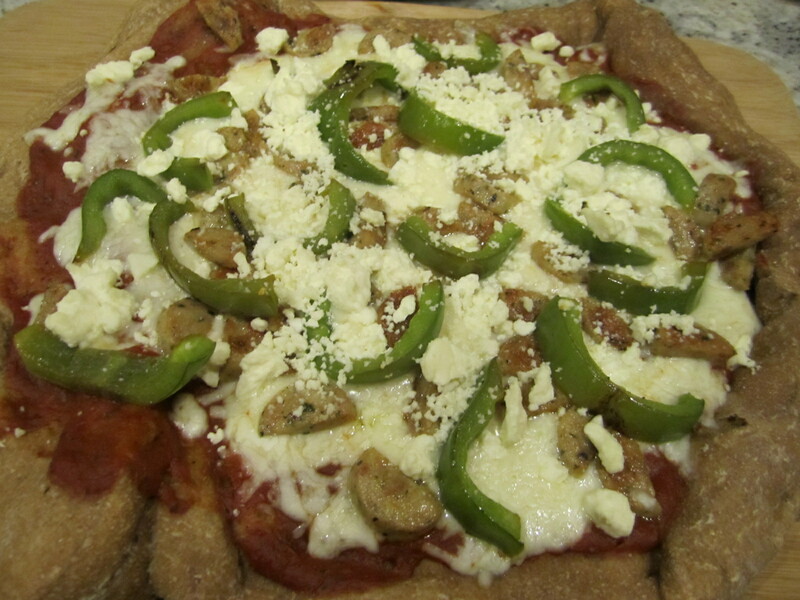 Pizza really is a simple meal to make, especially if you use pre-made dough and sauce. It was so hard to wake up this morning!! My eyes felt like they were glued shut! 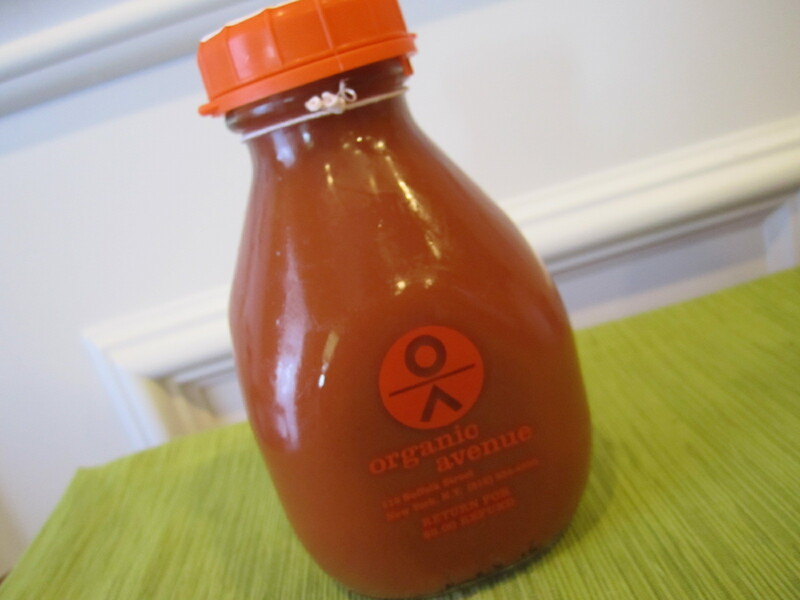 Luckily, I had another juice to enjoy from Organic Avenue. 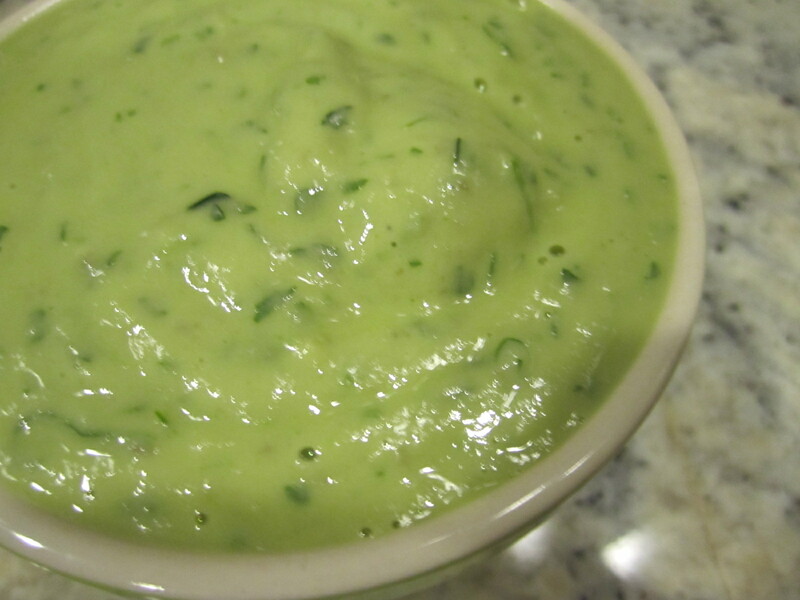 The cucumber, lemon and parsley flavors really stood out. 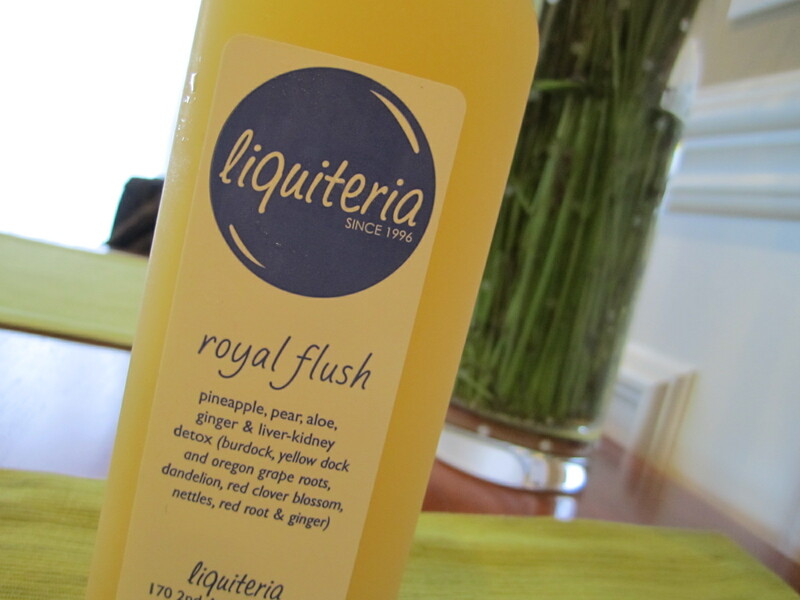 It definitely was not my favorite juice, but it was good. And, made me feel energized! 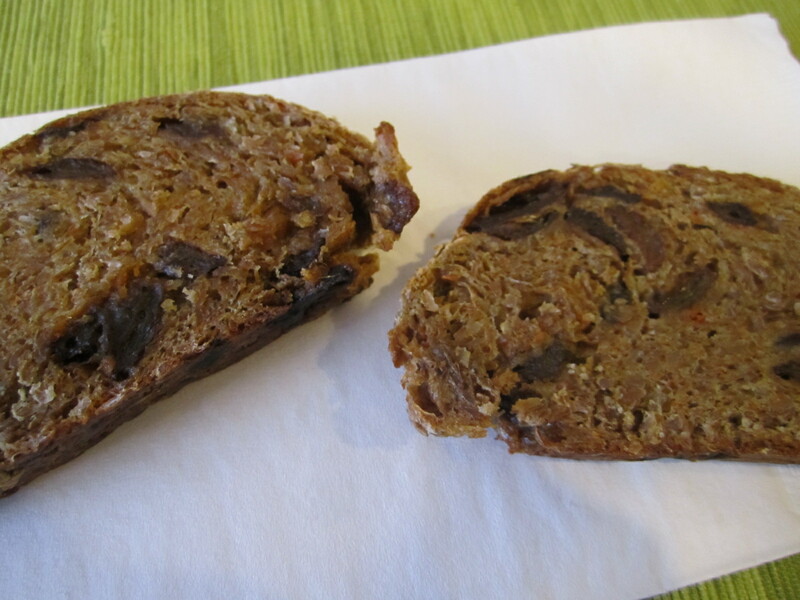 Along with my juice, I snacked on 2 slices of Carrot Raisin Manna Bread. 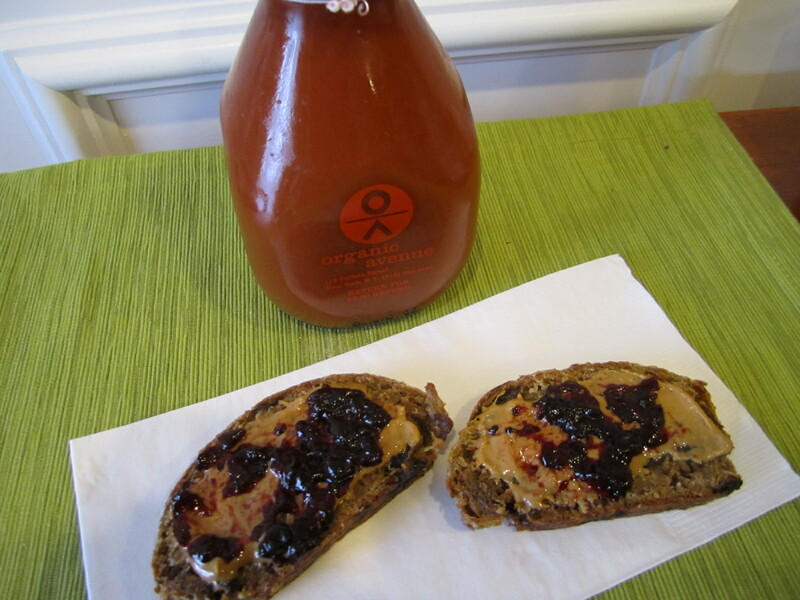 With a think spread of peanut butter and Crofter’s cherry jam. 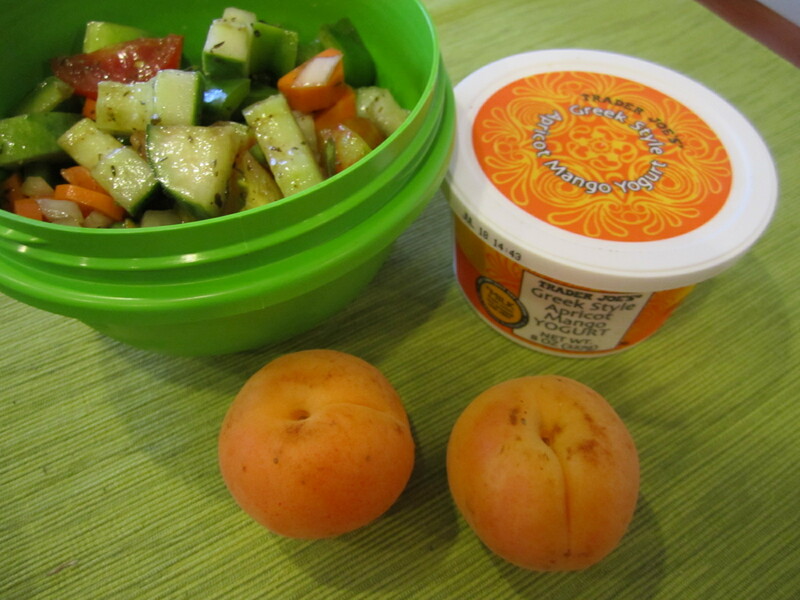 Lunch was interesting because we were down to minimal fresh food in the fridge! 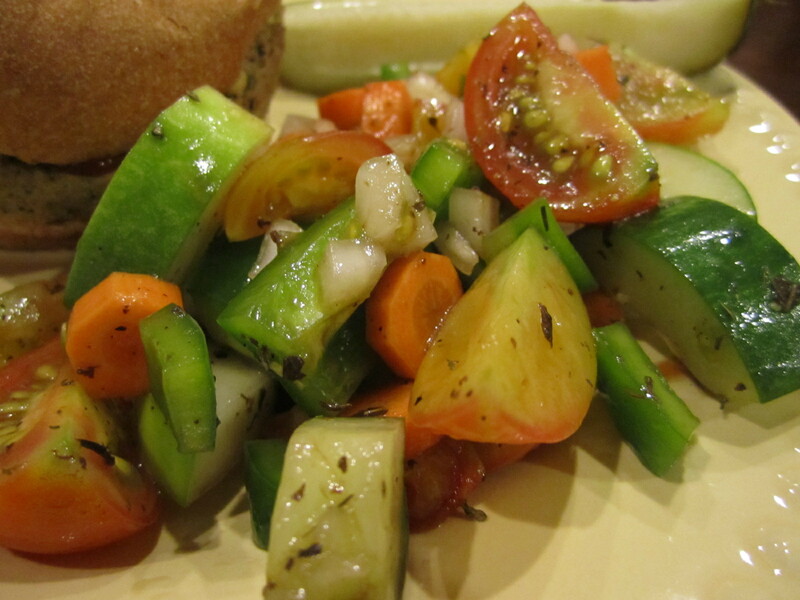 We pick up our CSA tonight, so we were completely out of fruits and vegetables except for 2 small pickling cucumbers. 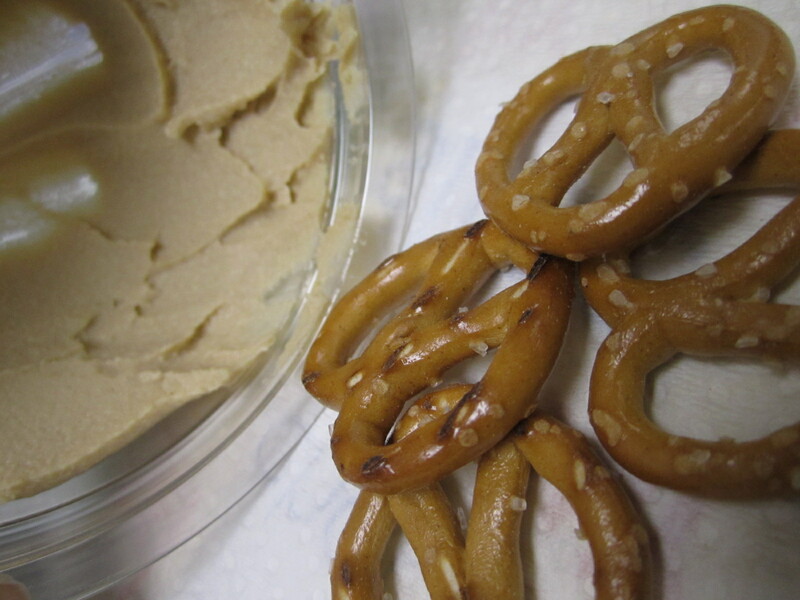 I sliced them up and ate them with lemon hummus and a mix of raw flax and rice crackers. 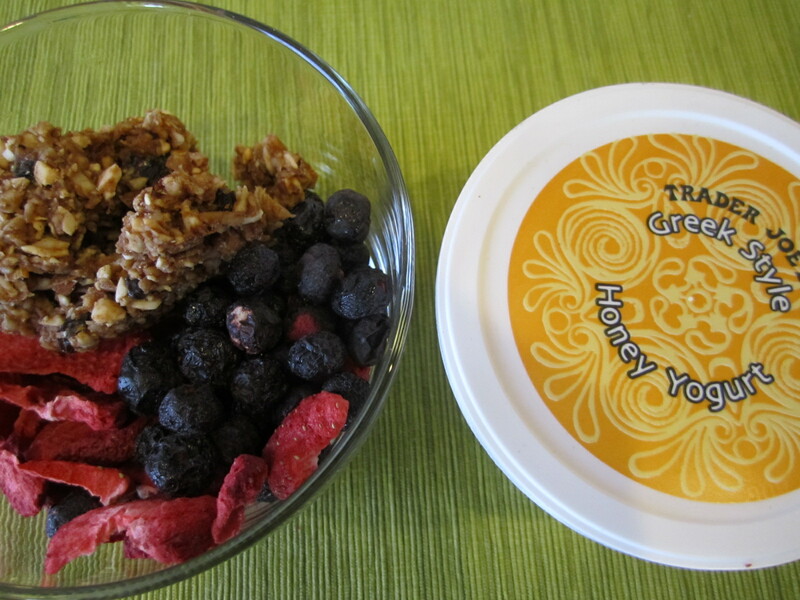 I also had a honey greek yogurt with raw granola and freeze dried strawberries and blueberries. 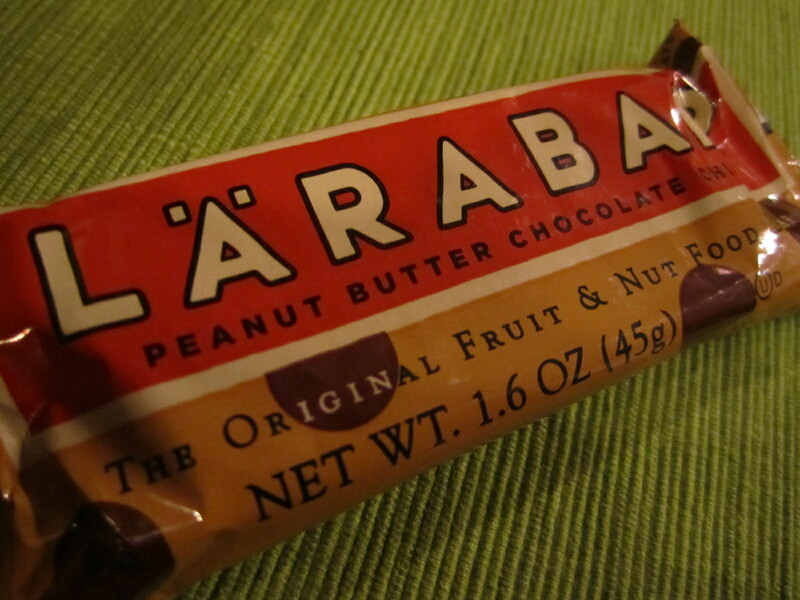 On the way to pick up our CSA, I found something I had been searching for – the new Larabar flavors!!! I dug right into the Chocolate Chip Brownie. It definitely tastes like a brownie and has chunks of chocolate in every bite. It was so good! 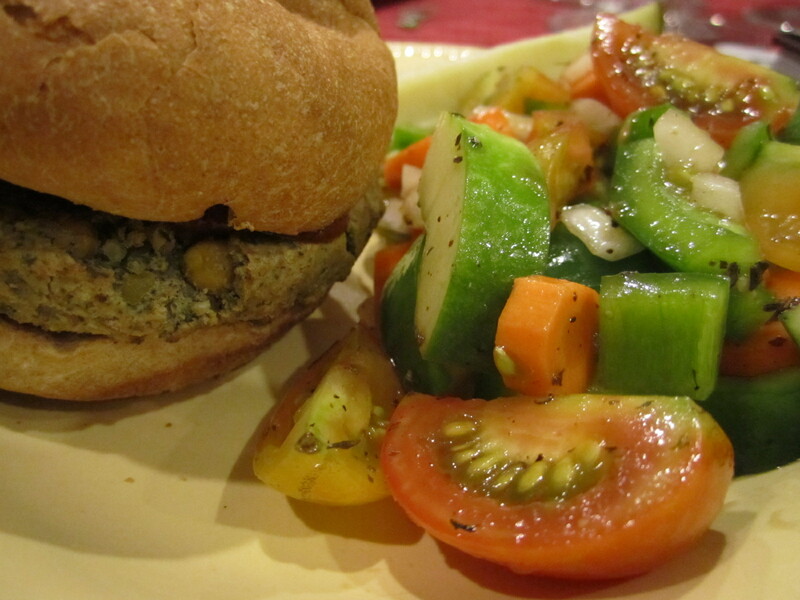 Dinner was thrown together pretty quickly, but at least we had fresh veggies! While Brant was getting my veggie burger and his eggs together, I made up a chopped salad similar to the one we had at Emily’s last night. 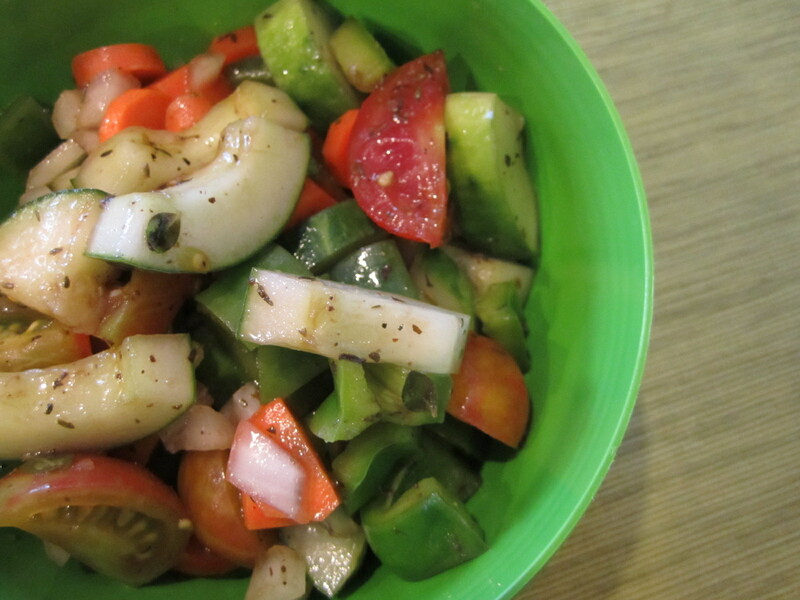 Green pepper, cucumber, spring onion, heirloom cherry tomatoes and carrots chopped up and mixed with honey balsamic, olive oil, salt, pepper and fresh thyme. It came out great. 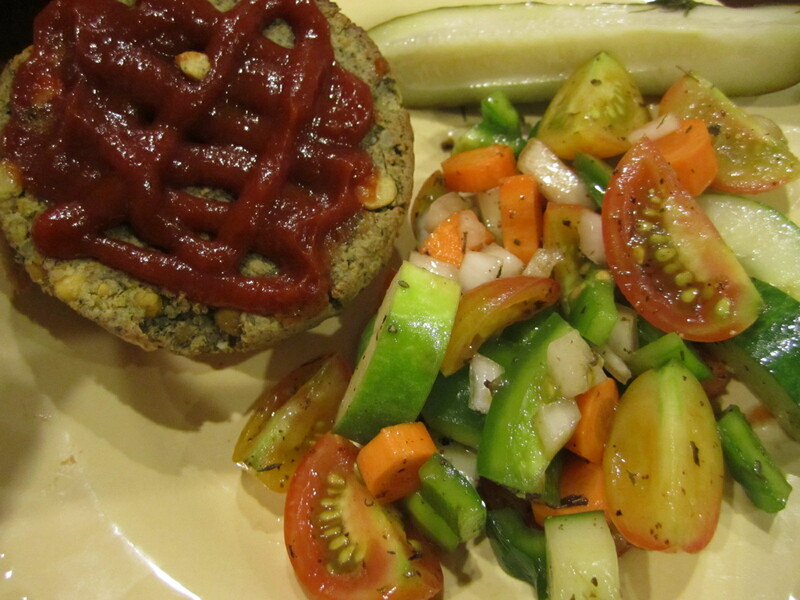 And, a veggie burger on a whole wheat bun with ketchup and a pickle. 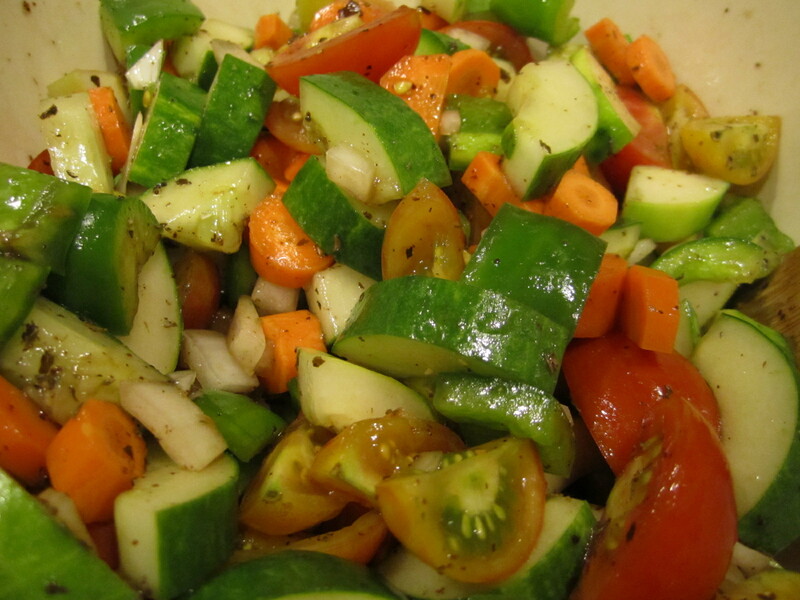 I really like making salad’s out of fresh chopped veggies. 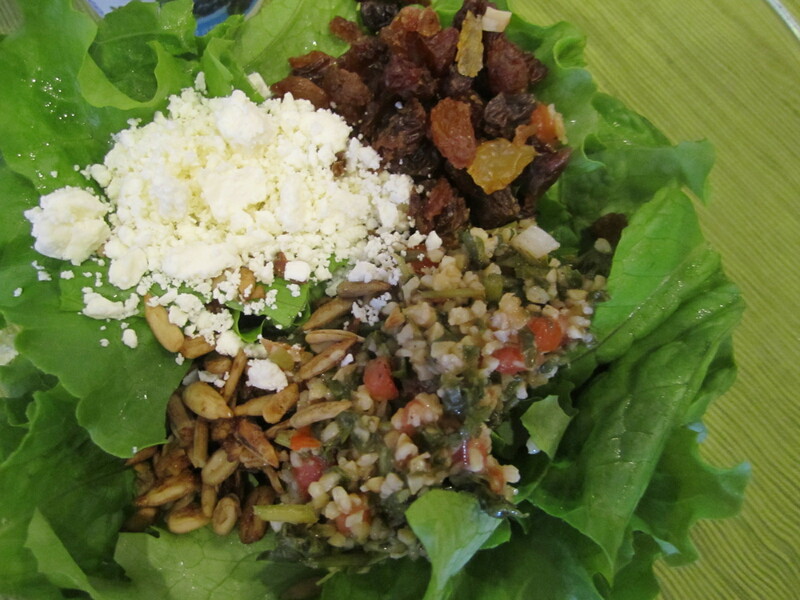 You don’t need any lettuce because everything is so fresh. 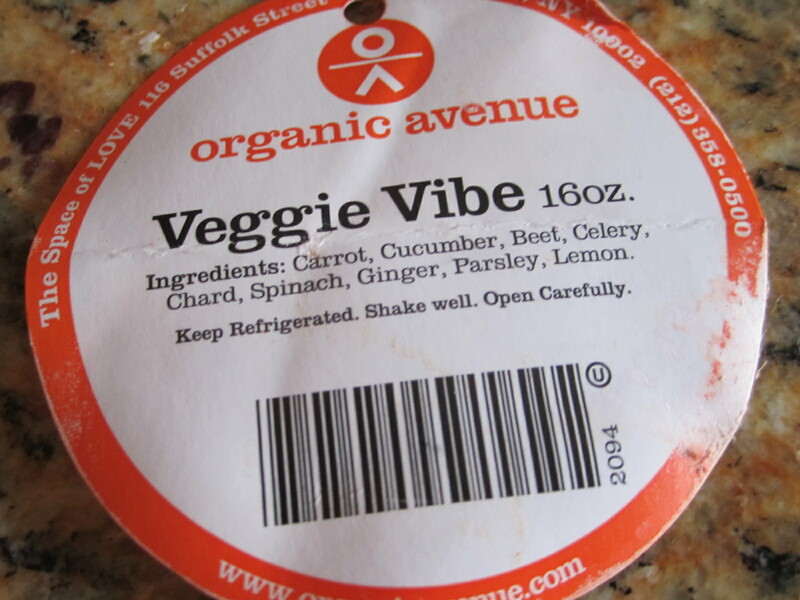 This would be great to bring to a BBQ or the beach because you don’t have to worry about lettuce wilting. 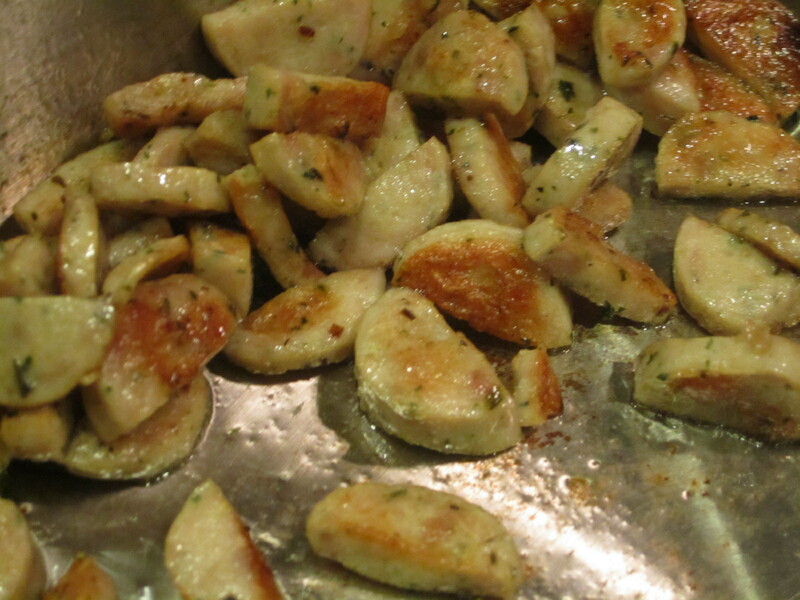 Make it the night before to let the flavors marinate throughout. I made a new, fun and delicious breakfast this morning! I cooked more quinoa than I needed for our dinner dish last night, so I made sure to save the plain leftovers for another meal. 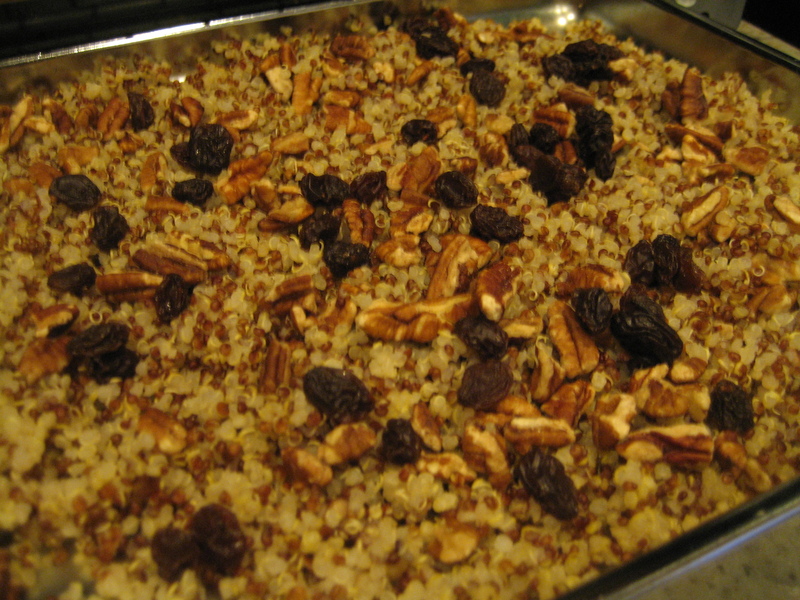 I have seen numerous quinoa granola recipes floating around the food blog world, and I thought I should try it out. I decided to create a quick version of a Quinoa Granola Yogurt Parfait that I could make within the 10 minutes I had for breakfast this morning. Since my quinoa had a tropical kick from being cooked in pineapple juice, I decided to pair it with yogurt. 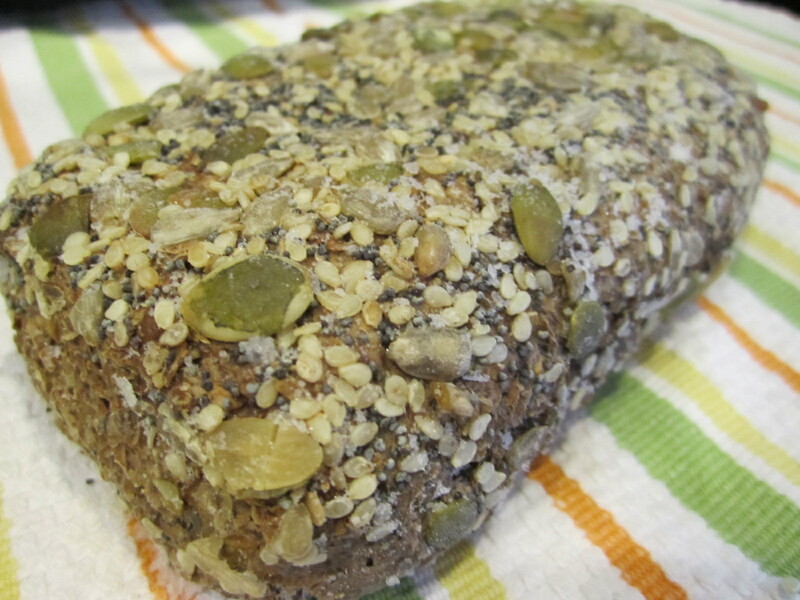 Here is what I did to create this quick breakfast treat! 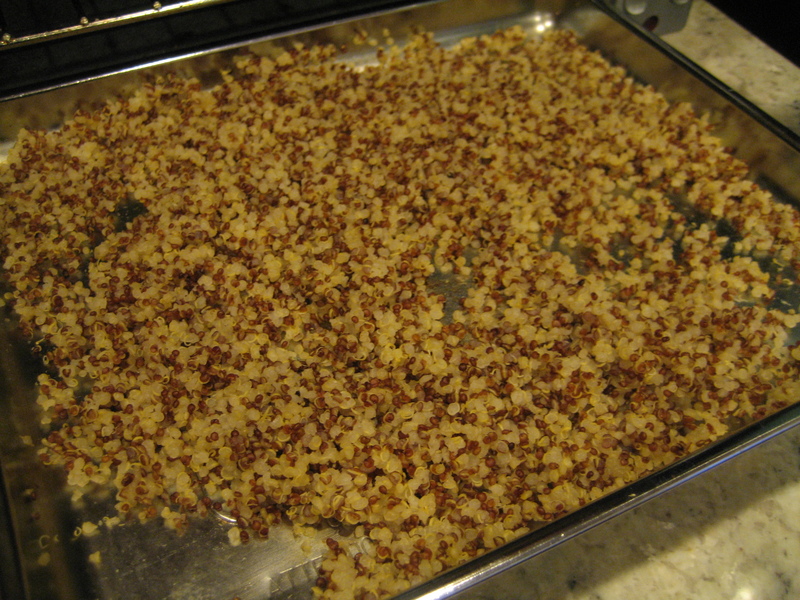 I spread out my leftover quinoa onto my toaster oven baking sheet (you could definitely make this in the oven as well! ), and baked it at 400°F for 5 minutes. 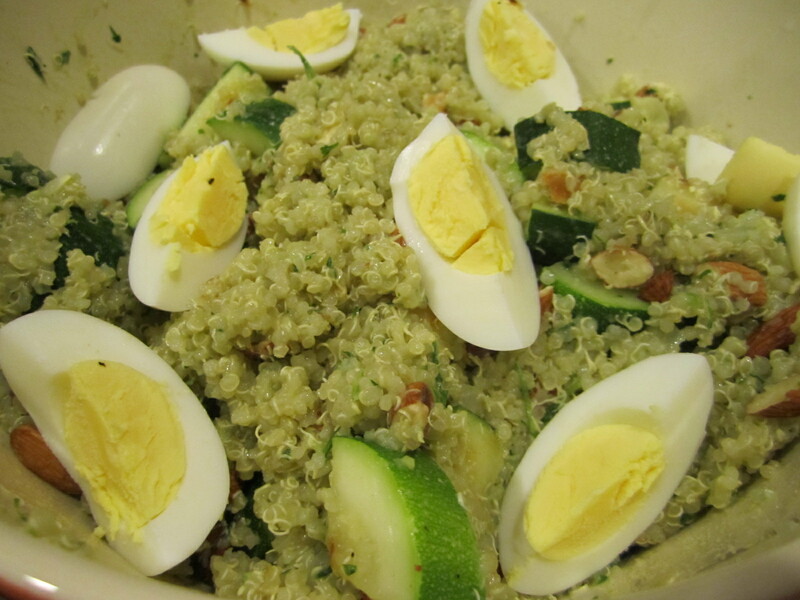 After 5 minutes, I took the quinoa out and moved it around to make sure everything was crisping up. At this point, I added chopped walnuts and raisins and put it back into the toaster, decreasing the heat the 350°F for 5 minutes. I was afraid that the walnuts were going to burn if I kept the heat up! After 10 minutes is was hot and definitely had a little more bite to it than it did last night. I was running out of time, so I took it out and let cool for a few minutes. 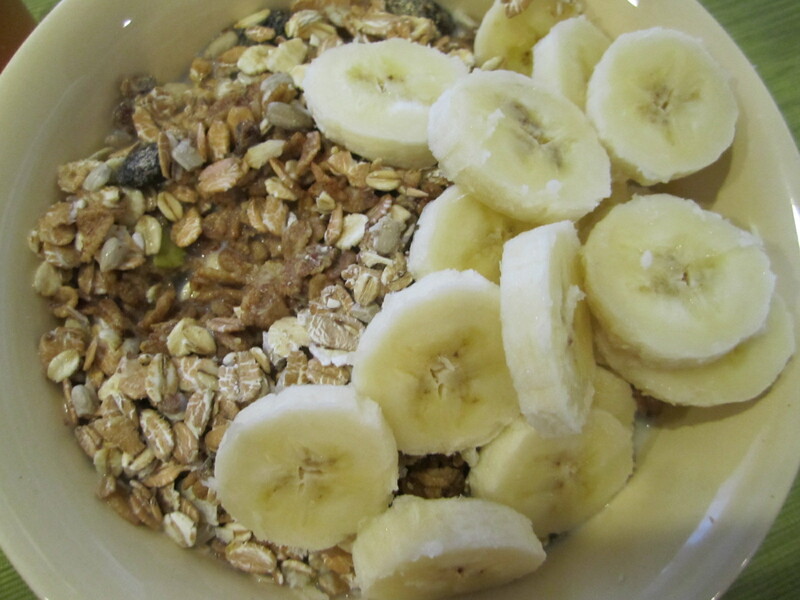 You could definitely leave this in longer for a more granola-like texture, but this was perfect for a quick breakfast. 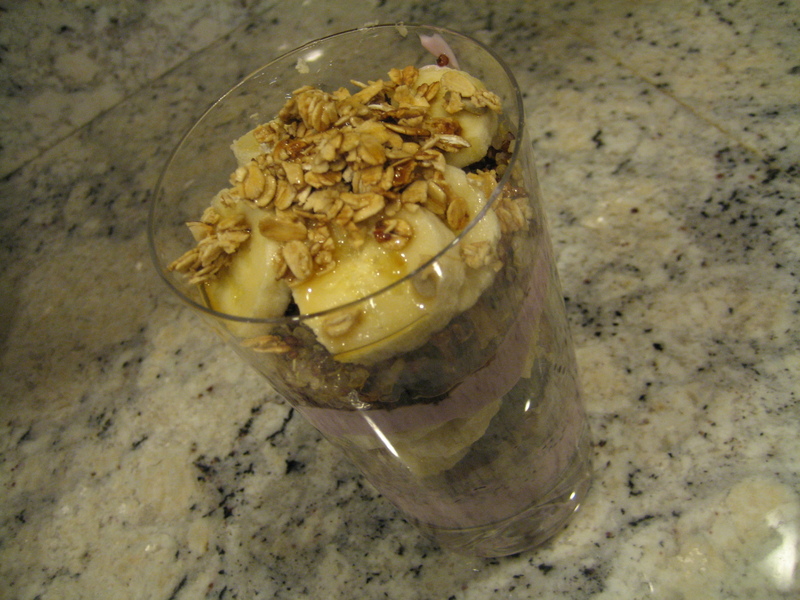 Then, made a parfait! 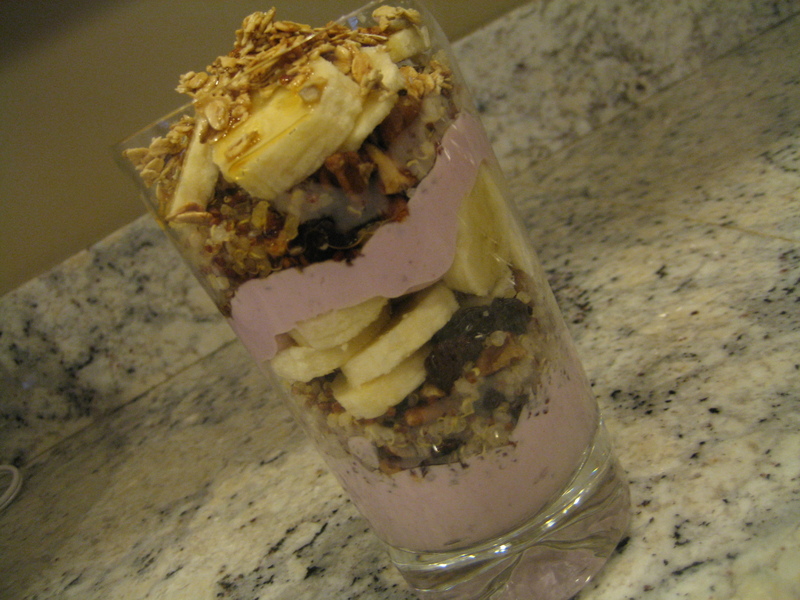 I layered my glass with wildberry Chobani greek yogurt, then quinoa granola, then bananas and repeated. I sprinkled a little Galaxy Vanilla Granola on top with a drizzle of pure maple syrup. Lunch consisted of more quinoa and leftovers. 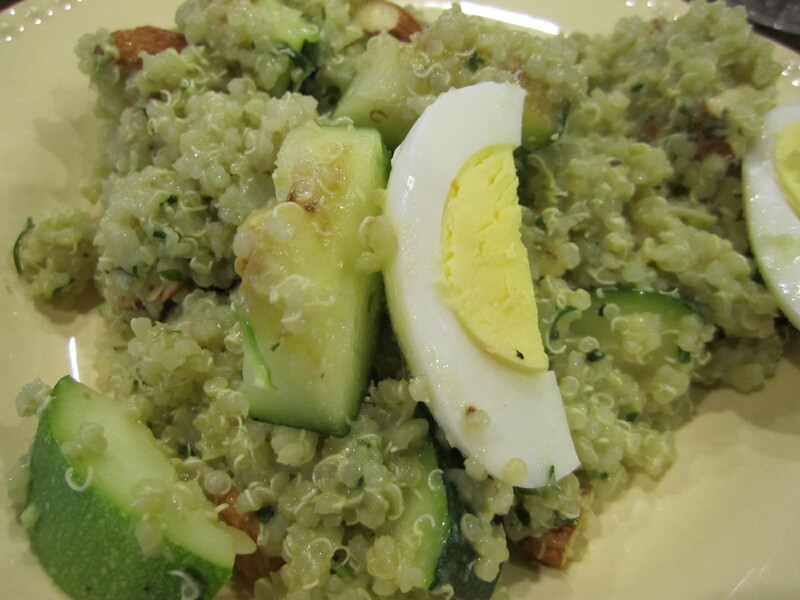 The Pineapple Cashew Quinoa is delicious the next day as well. 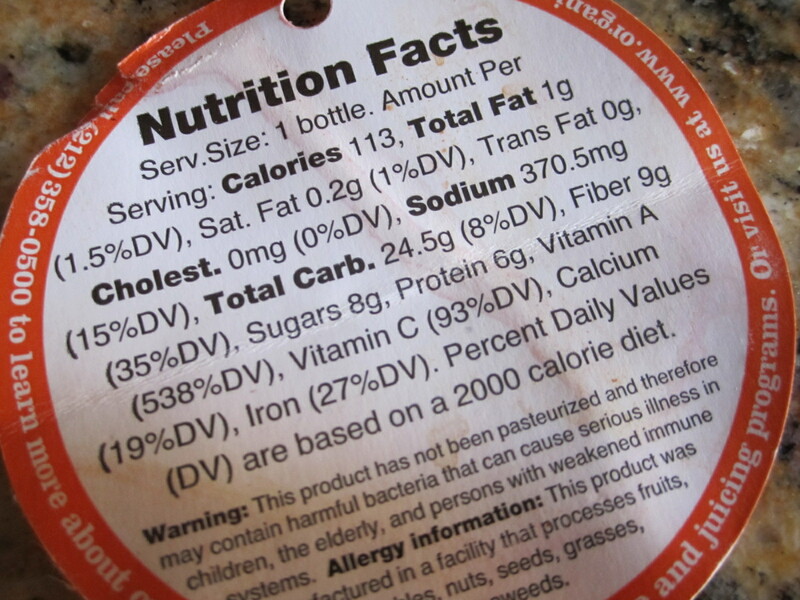 The flavors all blend together more, and the cashews were not as crunchy, but still obviously great! 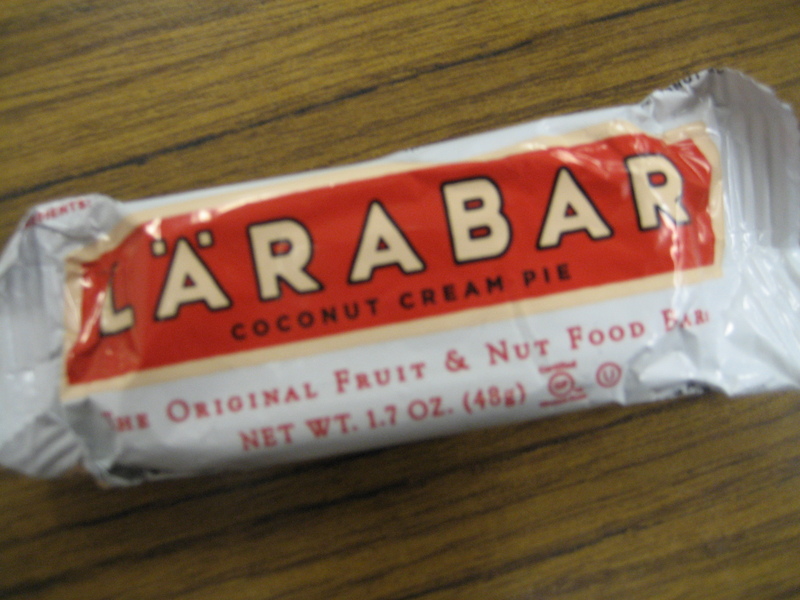 And, my favorite Larabar as an afternoon snack – Coconut Cream Pie! Dinner was also quick! I had to get started on some baking projects (recipes to come over the weekend). 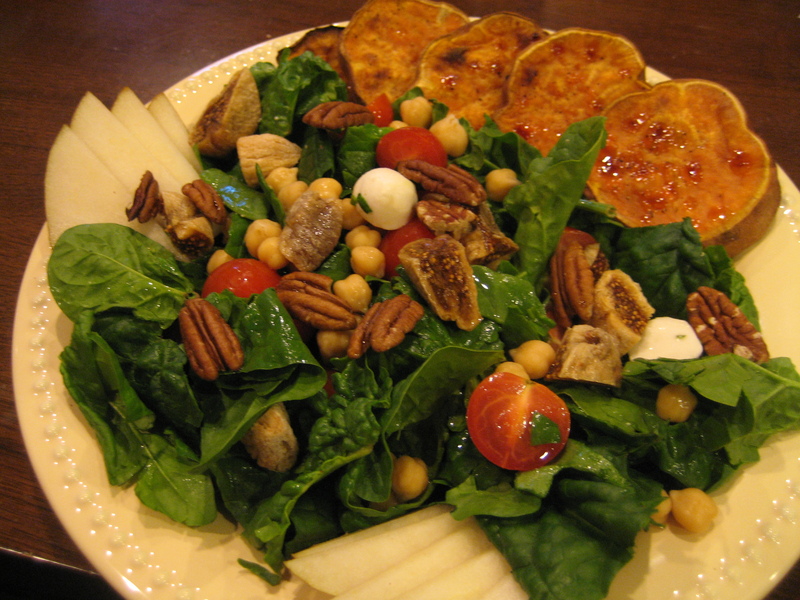 We had leftover Spinach Salad from last night as well, so I had a big plate of that. 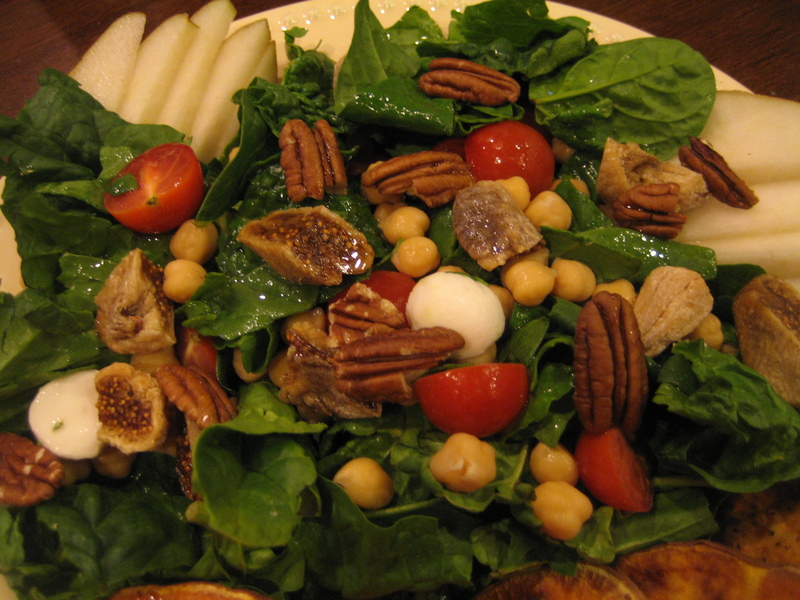 Grape tomatoes, mozzarella, chickpeas, diced turkish figs, pear, a few pecans and pear infused vinegar. 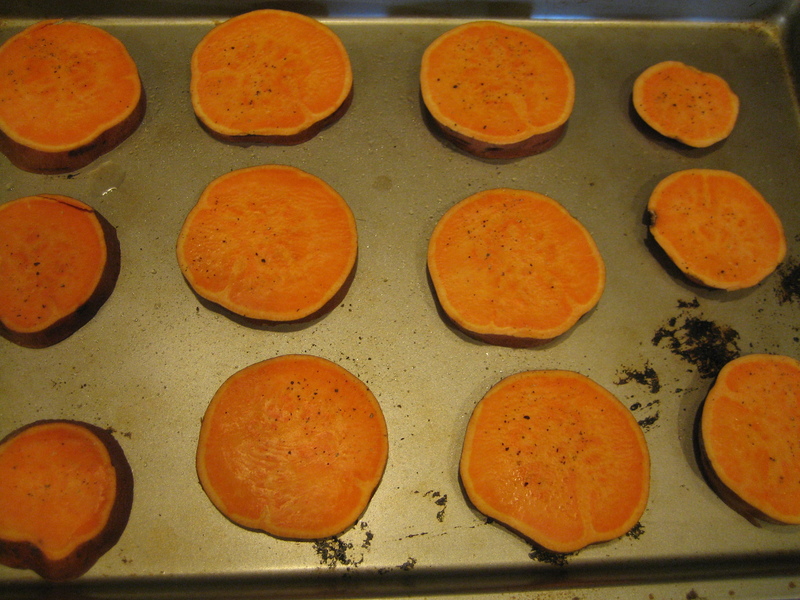 Then, place the slices on a cookie sheet sprayed with a little olive oil. I brushed the potatoes with a little coconut oil and sprinkled them with salt and pepper. 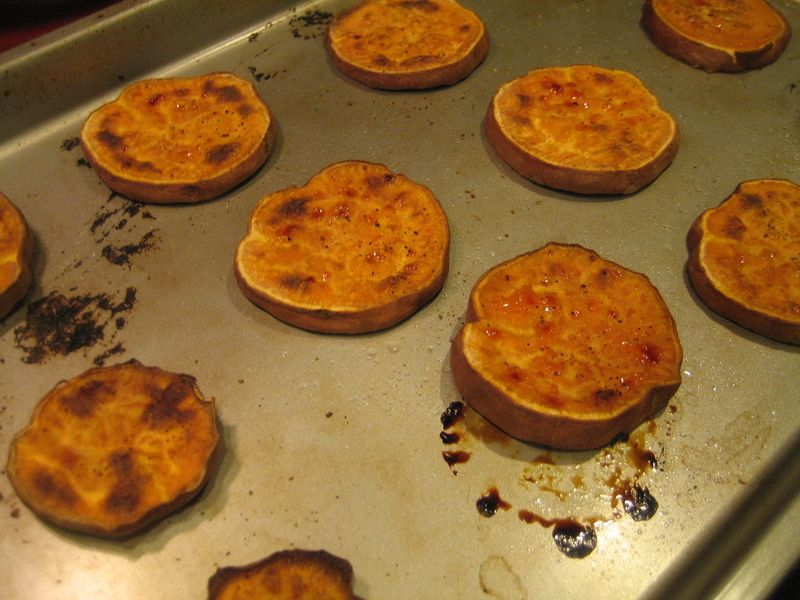 Bake them at 350°F for 30 minutes, then turn the heat up to 400°F and bake for another 20 minutes. This was the perfect amount of time for ours! 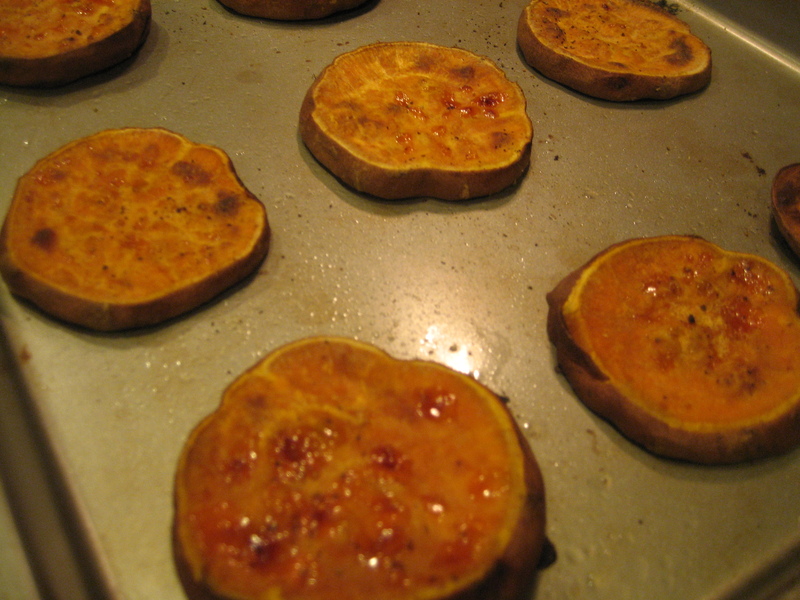 They came out of the oven steaming hot, browned and oozing with sap. They were a little crispy on the outside, and so so soft and creamy on the inside. 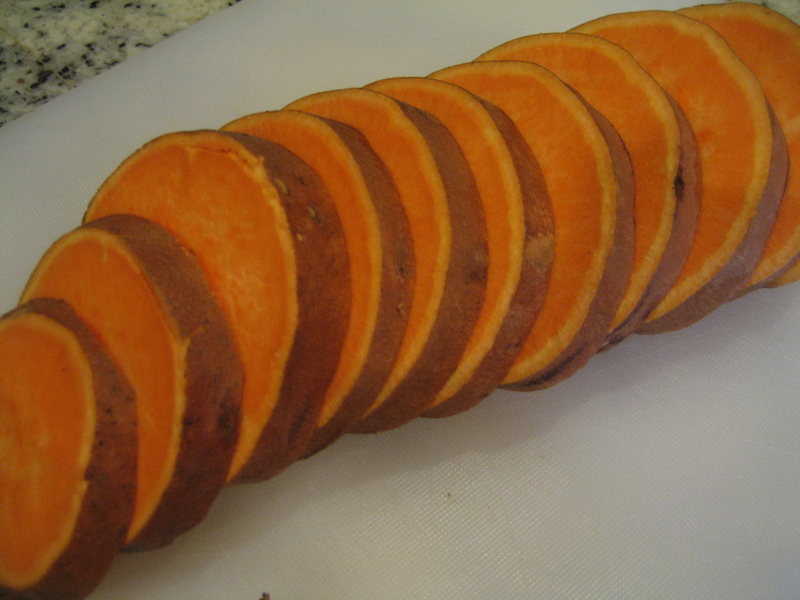 The best sweet potatoes ever! Paired great with a salad.